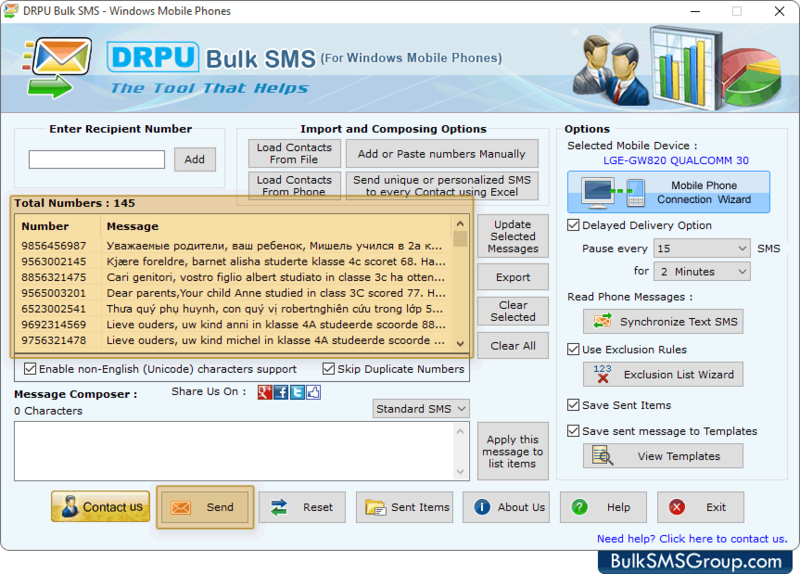 Mobile Messaging software is developed to compose and send bulk number of text messages from computer to group of mobile phone users via using Windows based cell phones, Pocket pc and PDA devices. Easily deliver bulk SMS to individual or list of phone numbers without using SMS gateway program or internet connection. Software provides exclusion list Wizard option to maintain the list of contacts or groups, which you may need to exclude time to time when sending messages. Send notifications or standard SMS to individual or list of phone numbers. Advanced delayed delivery option to control the load of bulk SMS broadcasting. Facility to skip duplicate numbers entries during the message sending process. Import contact numbers saved in Text/Excel file format for sending bulk SMS. Supports all Unicode characters to compose and send bulk messages. No internet connection is needed to send group SMS.